Combine vacation fun with volunteerism by working in the 1,000-acre Limahuli Garden and Preserve, part of the National Tropical Botanical Garden network, which features lush rain forest, ancient taro terraces (pictured), native plant species, and a plantation-era garden. Hanalei Colony Resort is partnering with Limahuli Garden to offer a package combining vacation fun with volunteer opportunities. The Beach & Botany Package requires guests to make a minimum commitment of two daily four-hour volunteer sessions per person at Limahuli Garden. To make sure it's not "all work and no play" for guests, the package also includes five or seven nights of accommodations at Hanalei Colony, a picnic basket lunch for two, a one-day kayak rental for two on the Hanalei River, an oceanside massage for two from Hanalei Day Spa, annual membership to the NTBG, and a special arrival gift for "tropical gardeners." 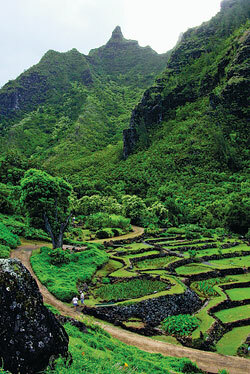 Volunteer activities at Limahuli Garden will take place at 8 a.m. Wednesdays, Thursdays, or Fridays. Guests will spend the morning assisting the garden's staff, choosing which of three activity levels best suits their physical capabilities and outdoor experience, ranging from a low level of exertion in the nursery to a high physical demand doing ecological restoration in Limahuli Preserve. The minimum age for volunteers is 14. Hanalei Colony offers 48 two-bedroom condominium units with full kitchens and private lanais, all with views of Hanalei Bay or lush mountains. Package prices range from $1,994.85 for five nights in an ocean-view unit during low season (Jan. 5 to May 31, and Sept. 9 to Dec. 19), to $3,489.85 for seven nights in a premium oceanfront unit during high season (June 1 to Sept. 8, and Dec. 20, 2008, to Jan. 4, 2009). Prices are subject to taxes and are based on double occupancy. The package cannot be combined with any other special offer. Call toll-free from Hawaii, the U.S. mainland and Canada (800) 628-3004 or visit www.hcr.com.